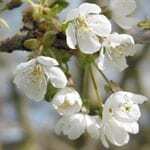 Wild cherry is not a particularly frequent tree in Northern Ireland, although it and other forms of cherry have been planted for many years for ornamental reasons. 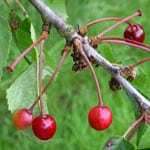 Often found on the edge of woodlands on alkaline soil, wild cherry can form a sizeable tree. Here it is at the edge of its natural distribution and tends to remain relatively small. 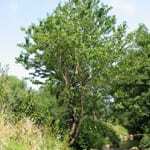 In warmer European countries it may make quite a large tree and is widely grown for timber. Though it is dispersed well by seeds (called stones), it makes suckers (young trees growing from its roots) freely, which makes it similar to aspen in this way of reproduction. 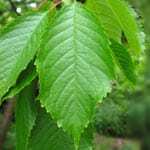 Leaves are alternate, 7-12 cm long with regular teeth and a pointed tip. The blade is hairless above. Below it has hairs on the veins. On the stalk there are two glands which are thought to attract beneficial insects – those that eat the insects that eat the wild cherry! The white flowers appear before the leaves. They stand in a group each on a long stalk. The flowers are similar to those of the bird cherry, dog rose and blackthorn. The cherries are red to dark-red, hanging in clusters on long stalks. They are edible, each with one stone inside. They are smaller than those from the cultivated trees but taste just as good, though they are more bitter. They ripen in July and are relished by large birds, especially starlings. A typical bark of the wild cherry tree is reddish-brown and smooth. It might have horizontal bands, which can peel off. The bark has a lot of ‘lenticels’. 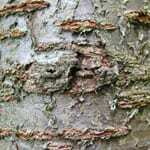 These are small pores in the bark, which allow cells below the bark to ‘breathe’. Flowers and leaves appears early to catch enough light before other trees close the top of the woodland canopy. 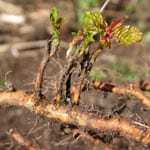 It grows in woodlands or on their edges, around streams and in hedges on rich and non-acid soils.